PowerPoint 2000 from Microsoft Corp. has vaulted to the top of the charts in GCN's survey of presentation software, so it's a safe bet that most users are pleased as Office 2000'with which PowerPoint is bundled'is introduced in federal offices. But PowerPoint 2000 users nonetheless had a few complaints. Nothing major; just a few quibbles. Most of the feds interviewed do not use a presentation program every day. They're occasional users, so they don't push the program to its limits. They just want to put together a nice-looking presentation without a lot of fuss. Take Jack Kaufman, for instance. The Seattle-based Coast Guard engineering deputy uses PowerPoint 2000 about twice a week for projects such as presentations for meetings. He finds the program does a perfectly good job. 'I can put together a presentation fast'a basic presentation, anyway,' he said. By contrast, he said, Microsoft PhotoDraw 2000, a new addition to the Office 2000 suite, is much better. 'The help in that is excellent,' he said. In Denver, Norman Pratt, an office automation specialist for the Federal Aviation Administration, also uses PowerPoint 2000 to build meeting presentations'about one project over the course of a month'having upgraded from PowerPoint 97. 'In reality, I think I like 97 better,' he said. For Pratt, the devil is in the details. Microsoft 'didn't really change it a whole lot. It's just that they changed some of the minor detail things that made it easy and nice to use,' he said. In the GCN survey, PowerPoint 97 maintained 75 percent of the installed base in the market canvassed, while PowerPoint 2000 has grabbed 6 percent. PowerPoint 97's predecessor, PowerPoint 7.0, retains 7 percent of the base. Overall, Microsoft PowerPoint versions dominated the survey, being used by 89 percent of the respondents. Versions of Corel Presentations had just a 7 percent slice. Despite its slim market share, Corel Presentations has loyal users. Mike Laughon, an Interior Department systems specialist, has been using versions of Presentations since it was introduced. 'I've kind of grown up with it,' he said. His office has just upgraded to WordPerfect Office 2000 from Office 8, so Laughon is just becoming familiar with Presentations 9. How does it compare to the program he previously used, Presentations 8? The Government Computer News Product Preference Survey is designed to give federal buyers detailed quantitative data on specific computer and communications products, as rated by federal users. The survey also measures the relative importance of product attributes in selection of those products. 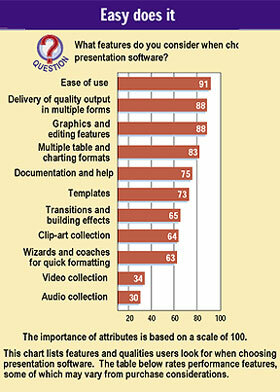 This survey on presentation software was part of a questionnaire mailed to 4,000 federal readers of GCN who on their subscription application forms identified themselves as buyers and users of presentation software. We received 191 responses to this part of the questionnaire. The presentation software in the survey was chosen because it represents the bulk of such products used in government. This report lists results only for those versions that received at least eight responses. The overall rating for each product was developed by averaging all individual attribute scores. Top scores are in red.